Virginia-built schooners first appeared during the American Revolution. 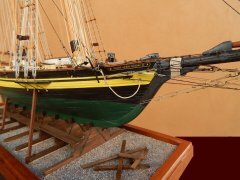 Known as Baltimore Clippers, they helped establish the Port of Baltimore as a major shipbuilding center.In 1974, Baltimore city officials decided to build a replica of a 19th century clipper to serve as good-will ambassador for the city. The ship, named Pride of Baltimore, was launched at Baltimore's Inner Harbor on February 27, 1977. She was lost in micro-squall on May, 1986. The city then commissioned a larger sister-ship, and the Pride of Baltimore II was launched on April 30, 1989.